After months of speculation, Subaru Australia has rubber stamped a fourth consecutive tilt at the Australian Rally Championship (ARC), but with a different team running their one-car operation. Molly Taylor will continue to pilot the team’s WRX STI, but Craig Brooks will take over from fellow Tasmanian, Les Walkden, as the team principal and car builder. After winning the ARC in 2016 with Les Walkden Rallying (LWR), followed by second place in 2017 and fourth in 2018, Subaru will partner with Brooks’ Burnie-based Orange Motorsport Engineering for 2019. In 2018, Brooks ran a privately-entered WRX STI for Steve Glenney, who went on to finish second in the ARC after an up and down season. Glenney crashed the team’s Subaru at the penultimate round in South Australia, after which they leased a Skoda Fabia R5 for Rally Australia, where he went on to finish as the leading Australian driver home. Subaru driver Molly Taylor will again pair with New Zealand co-driver Malcolm Read in a Production Rally Car (PRC) class All-Wheel Drive WRX STI, with the team hoping for more speed and more success in 2019. “I’m excited for the whole team – it’s a great recognition of the skills of a group of very talented people that we have put together, and which I’m privileged to lead,” Craig Brooks told RallySport Magazine. “They’re clever and passionate, and we all hope to maintain that love of the sport, even though the stakes will be higher this year and we’ll have a higher level of responsibility. “It’s a real feather it the caps of our guys, who are good motorsport engineers and have earned the respect of their peers,” Brooks added. Craig Brooks purchased Molly Taylor’s winning ARC winning car at the end of 2017. The 2019 Subaru will be painted in corporate colours, with some new PRC freedoms that are expected to be announced soon, and which Brooks hopes will make the car even easier to engineer. As for a second car for last year’s driver, Steve Glenney, that’s still some way off. “I’d love to run a second car for Steve, but we simply don’t have one at present, nor do we have the time to build one before the first round in April. “I’m certainly not ruling it out though,” he said. Subaru Australia Managing Director, Colin Christie, thanked LWR, while welcoming a new association with Brooks. “We’ve had a fantastic three years with LWR, spearheaded, of course, by Les Walkden, who has brought so much to the sport – and of course Subaru – over several decades. 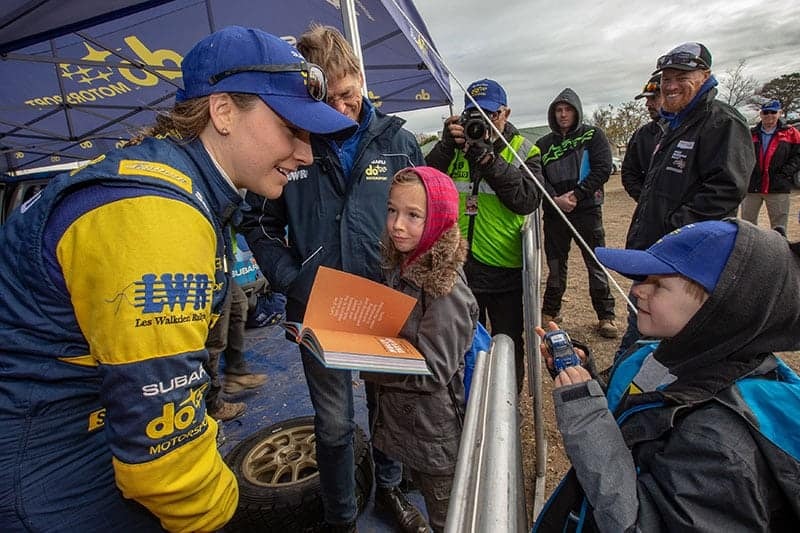 Subaru’s Molly Taylor is a fan favourite at Australian Rally Championship events. Molly Taylor is also buoyant about the season ahead. “We can’t thank Les enough for all that we’ve achieved over the last three years and, of course, winning the Championship in our first year, in 2016, was fantastic and will forever remain a highlight of my career,” the Sydney driver said. She added: “Equally, we look forward to working with Craig and his operation to challenge for the championship in a highly competitive field.